Character deaths on the small screen, no matter how inconsequential to the narrative, almost always carry significant emotional weight. This is especially true with sitcoms, where emotions can be exploited more easily, where exaggerated sentimentality is inherent in the form. A character death on a serious drama might have a lot more to grapple with thematically and in terms of character development, but the sitcom has the benefit of painting in broader strokes, allowing for bigger emotions no matter how exploitative they may be. Some character deaths are heavier though simply because of the reality behind them. When Carol Ann Susi died after a brief battle with cancer this past November, anyone who watched The Big Bang Theory couldn’t help but wonder how her character, the always-present but rarely seen Mrs. Wolowitz, would be removed from the show. “The Comic Book Store Regeneration” gives us an answer, and it’s a fitting, low-key goodbye (or start of one, rather) to one of the show’s more memorable and abrasive characters. Outside of those last few minutes, “The Comic Book Store Regeneration” is mostly a lifeless half-hour of television, one that feels scattered and haphazard. While not necessarily clear in the moment, it’s obvious that everything in the episode is building towards the reveal that Howard’s mother has died. While the arc is obvious in hindsight, that doesn’t mean it’s well-executed. That final emotional crescendo is certainly powerful, but perhaps underserved by everything that comes before it. Th episode largely revolves around the reopening of Stuart’s comic book store. Having lived with Mrs. Wolowitz for months, and having borrowed money from her to invest in the new store, Stuart is finally ready to reopen his business. The gang wander in and out of the store as the final preparations are made, everyone ecstatic to see that Stuart seems to be well on his way to rebuilding his professional life. Howard, who’s been uncomfortable with the closeness of Stuart and his mom ever since she took him in after the comic book store burnt down, isn’t so thrilled. When he sees that his mom’s sofa and chair, the same ones that he sat on in the den as a child, are now set up in the comic book store, he loses it. He lashes out at Stuart for taking advantage of his mother and changing things that, for him, have been constant since he was a kid. In the moment, Howard seems petty and childish. His actions, predicated on an earlier call from his mom from Florida, who asks Howard and Bernadette to check in on Stuart in case he’s lonely, ring as entitled, and are completely ignorant of everything Stuart has gone through. As the episode rolls on though, and it becomes clear that the episode will involve the death of Howard’s mother (for those of us that were aware of Susi’s death, at least), the emotions ring more true. We’re all flawed people, prone to lashing out at our parents, friends, siblings, etc. We rarely spend our time thinking about how our lives would be affected if someone we loved were to suddenly not be there. Perhaps that’s because we distract ourselves with more trivial matters, like where the furniture that represents out childhood ultimately ends up. It’s more likely though that we just get used to the people around us. We take them for granted, we say bad things about them, we use them as a punching bag for our innermost issues and insecurities. Such actions don’t come from a place of hate though. In fact, it’s the ones we love the most that bear the brunt of our anxieties, that see ourselves at our absolute worst. Howard is deeply flawed. He’s a man who has some serious issues with abandonment and often disguises pain with humor. He reverts to a child-like state whenever his life is in flux or something threatens to change his status quo. It’s why he sees Stuart’s big moment, one that should be celebrated, as something that only affects him. As abhorrent as Howard’s behavior is, it serves to underscore a very important point: we tend not to appreciate those that we love until it’s too late. It’s not until it’s too late that we recognize how our lives are often filled with trivial confrontations, and how easy it is to be self-centered in this world. The last few moments of this episode are beautiful because they expresses a common truth, which is that death isn’t always something that’s foreshadowed. It can come out of nowhere and completely shake our world, and perhaps we should spend more time empathizing and helping those around us, rather than remaining stubbornly focused on our own interests. It’s an idea that manifests itself in the interaction Sheldon has with Howard just after he finds out about his mother’s death. Sheldon jumps in to say something, and everyone in the group tells him this isn’t the time. They’re worried he’s going to stick his foot in his mouth and say something completely inappropriate. 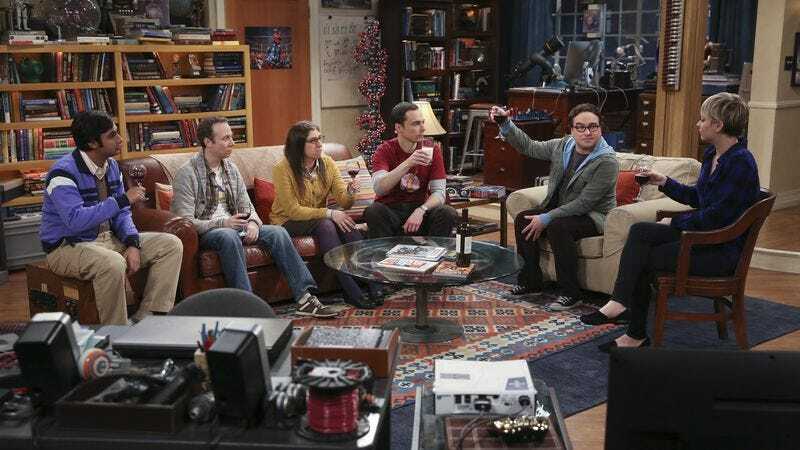 Sheldon is more empathetic than the group gives him credit for though, and its a testament to the show’s engagement with its past that Sheldon, who lost his father at a young age, is the one to comfort him. “When I lost my own father, I didn’t have any friends to help me through it. You do,” he says. It’s not only a moment that gives Sheldon some necessary depth, but also gets back to the theme of appreciating those around you. It’s a statement of comfort, but also one that reminds Howard of what’s important, which is the people that stick by us even when we’re the worst versions of ourselves. It’s strange that a Nathan Fillion cameo was so haphazardly inserted into an episode that would clearly be remembered for saying goodbye to Mrs. Wolowitz. Not the most memorable way to use the Firefly star. Howard once got a ribbon from swim class for sticking his face in the water. Is it his mother that coddled him, or society, man? I thought it was interesting that when Penny thinks back to all the times Amy was secretly testing her for a lab experiment, she’s always on her phone. Even when Sheldon is asking her how to “let it go” in the present, she’s on her phone. Why is she so absent and uncaring?!? Sheldon sneaking back into the apartment after realizing that Penny and Amy are fighting in the hall, and that the confrontation is because of him, was a great comedic beat.